Hasbro released their newest version of this gruff, take no nonsense, Deceptichop bustin', Optimus Prime guarding Autobot in their 2008 Classics line. A lot of folks were not happy with him. While his Alt-mode was updated, his transformation was awkward, his head wouldn't raise all the way up; making him always looking down and seemingly dejected, and his colors were a bit too bright. This past year, 3rd party manufacturer iGear released both their PP05W - Weapon Specialist and PP05M - Medical Specialist as better examples what could be done for Ironhide and Ratchet. Did they succeed? Or was it all just heroic nonsense? Take a look after the jump. Ironhide was always one of my favorites as a character despite his toy. G1 Ironhide was nothing like his cartoon counterpart and why the animation studio went that route, I'll never know. Since then, Ironhide has gone through a few different character changes, Energon Ironhide being my least favorite. But eventually, with Dreamwave and IDW's relaunch of the Transformers titles, we got good 'ol gruff and angry Ironhide back. What's worse is that it happened to save Rodimus. 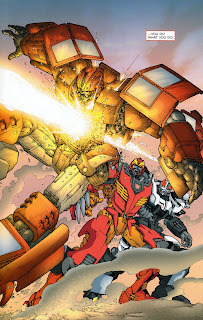 Since then IDW resurrected Irohide and then went to show us that he became the last surviving G1 Autobot in a future where ALL Transformers are Multi-formers and he retells the tales of his past to pay tribute to all that was before this new golden age. I liked it, it was kind of neat. 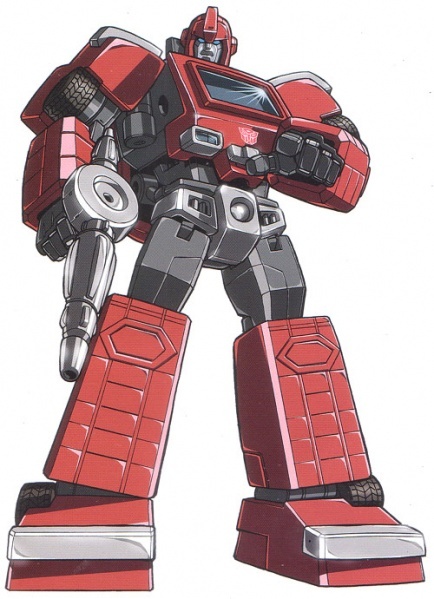 But, back to the past and the G1 Ironhide we all love. iGear has delivered... in SPADES! The PP05W is a perfect rendition of G1 Ironhide that pays homage to his toon form. PP05W's box alone is a nice piece of work. It's sturdy cardboard with some excellent artwork and pics on it. I ordered my PP05W from BBTS... and they still have plenty available HERE. Now, when you order from BBTS, you can more often than not pay a little extra for a C9 condition package; I usually don't and I've never had a problem. Until now. My PP05W came... a little banged around. The left hand side of the box came a little crushed and creased. And honestly, I don't mind. As long as the figure was intact, and it was, I was happy. The back of the box gives us some incredibly detailed line art of PP05W and ALL of his accessories. I love the bit about the damaged form... sound like a familiar Alt-mode we may know? Contained within, we find PP05W packed nice and neat into a plastic tray, in a plastic bag. Open up the plastic bag and we find our tray for PP05W and we have a smaller bag that holds his instructions and Tech-Spec card. The instructions are pretty straight forward. PP05W is in grey and white tones and the parts that the step is telling you to move are in red. The back of the instructions shows off some of iGear's other pieces, all of which are homages to the G1 minibots. I REALLY want Hench, the Brawn piece. The Tech-Spec reminds me of the Tech-Specs that all of my Japanese pieces have come with, about the size of a trading card with art and values for the characters attributes. This card is no mere card, it's actually plastic, very nice! Now for the big guy himself! PP05W and his gear come packed in 2 trays with 2 lids. Take the lid off of the top most tray and you have 2 extra heads. Both are modeled after IDWs rendition of Ironhide with one grinning and one sneering. There are 2 arm cannons that mimic the weapons used by movie Ironhide. There are two blaster-looking pieces that fit over PP05W's hands that mimic the built in fire extinguishers of toon Ironhide. 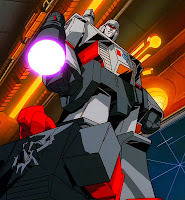 There is a large chromed missile launcher that pays homage to the missile launcher on G1 Ironhide's Battle Platform. The last item is a blue visor that snaps onto PP05W's head to help him guide whatever weapon he decides to rain death down upon Decepticon cranium. Underneath the first tray is of course, the second tray. This tray holds PP05W himself in his Alt-mode along with some more firepower and a few melee/utility weapons in the form of a combat knife and some saw blades. PP05Ws larger firepower comes in the form of a sniper rifle and an over the shoulder cannon. There is a laser rifle that is very much an homage to the G1 Ironhide's weapon that fit on the front of his Battle platform. There is also a small radar dish that uses a C-Clip to attach to PP05Ws forearm that mimics Ironhide's Sonodar Sensor for walking around in the dark (Well done iGear!). Before we get into gearing PP05W up, we have to take a look at him. Taking him out of the tray, he has some heft to him. A lot of his parts seem thick and well built; with a little die-cast thrown in. His Alt-mode is pure G1... total win for iGear on this homage! There is some chrome on the bumper and grill, as well as the wheels and frames of the light. PP05W's tires are actually rubber as well. Molded in primarily red plastic, there are a few paint apps in black and yellow to give him a little more color. Since this is an homage to G1 Ironhide's toon, there's not much else... and he's beautiful in his simplicity. The rear roof panels open up and fold out and you basically "break" him in half, you'll see his arms and hands were hiding under those panels. Focusing on the front of the Alt-mode, we'll get his upper body transformed. The roof of the Alt-mode folds back allowing for the head to rotate up then swings down behind the head. There is a post behind the head that pegs into place holding both the head and the roof section in place. Swing his arms down, and the upper portion is done. PP05W's legs fold out fairly intuitively... the mid panel of the Alt-mode folds inward to form the back of the leg. The feet swing out from the bottom and the die-cast heel folds out. The one tricky part is the panels on ball joints that form the top of the Alt-mode... the bar that they are a part of is on two hinges that have to be swung up, back, and down, forming an upside down 'V'. The bar then fits into a divot in the mid-panels that form the back of the legs and then rotates on the ball joint providing an extra layer on the back of the legs. PP05W is now ready to wreak some ungodly firepower havoc. While their Alt-modes are not much different in size, the difference in size between Classsics Ironhide and PP05W is really noticeable in Bot-mode. PP05W comes packed with 3 different heads. The head mine came packed sporting is a very nicely detailed G1 homage. The second 2 heads pull from the current IDW look for Ironhide. One is molded sporting a grin, the other a sneer. Since the Ironhide in my head is always ready to throw down, when he goes on display, he'll more than likely go up so with the sneering face. Since he IS the PP05W Weapon Specialist... as I mentioned above... he comes with a ton of gear. Since he came with it packed into his Alt-mode, his pistol comes first. It comes folded up and is simply... unfolded. During G1, most of the Transformers had some sort of innate ability or built in utility device. 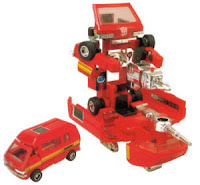 Ironhide was seen wielding and array of these; fire extinguishers, Sonodar Radar, and a saw to name a few. And sure enough iGear has delivered. PP05W has 2 cannon looking pieces molded in straight black that come in halves and then fit into and then cover the hands. I believe that these represent Ironhide's fire extinguishers. The second set of hand attachments are saws. Molded in black, they split the same way the fire extinguishers do. The saw blades themselves have been vaccu-chromed. PP05W has 2 small panels in his forearms that open up. The first contains a post hole where you can peg into place the laser rifle that pays homage to G1 Ironhide's Battle Platform laser. The second, has what appears to be a keyboard. Both have a small bar that a C-Clip can connect to... which just happens to be how the Sonodar Radar dish connects. The second homage weapon we have for PP05W is a vaccu-chromed shoulder held missile launcher. Modeled after G1 Ironhide's Battle Platform launcher, it's held rather than set in place. I decided that since it doesn't really have any type of sighting device, it would be a good weapon to pair the blue visor with. I'm fairly certain... and it has been shown... that Ironhide prefers to use his fists. But just in case, PP05W was provided a very nice combat knife that pairs well with his pistol. You'll notice it has a C-Clip on it allowing it to clip to the bar on his forearm, or as a bayonet on the sniper rifle (which I didn't take shots of). The aforementioned mentioned sniper rifle is impressive to say the least. it breaks down into a few parts, but nothing really small enough to store anywhere on PP05W. I was a bit sad that his articulation doesn't really allow him to get some great sniping poses (especially prone) but nonetheless, it's a nice accessory. PP05W's other large weapon is an over the shoulder cannon. THIS is a nice piece of hardware... something any Weapon Specialist should be armed with. PP05W also comes with 2 large arm-mounted cannons a'la movieverse Ironhide. These things are big with no real place to store them. If this were a movie Ironhide homage, he'd definitely be displayed with them. But, since this a G1 homage, they'll stay in the box. My verison of Ironhide pummels things... A LOT. Overall, I feel the PP05W Weapon Specialist is an amazing figure. He's well-built and feels sturdy. His transformation is not overly complex and but lends to quite a bit of articulation. The amount of accessories he is loaded with is near staggering and allows for a myriad of looks. iGear seriously knocked this homage to Ironhide out of the park and I look forward to picking up his twin, the Ratchet homage, PP05M Medical Specialist (who is STILL available for purchase at BBTS HERE). I highly recommend iGear and their pieces. Based on a suggestion from one of our readers Paxcybertron that I missed out on in my GDO Cliffjumper review... Cliffjumper gets a new gun. PP05W with Hasbro MP-10 Optimus Prime... while a little larger in scale to the Classics, PP05W is still a bit smaller than Optimus. If he were a little larger, I wouldn't mind. Review, pics, and heroic nonsense by Scion of Primus. YAY! You used my idea! Honestly, it just SCREAMS Cliffjumper, and its not like Ol' Red needs that cannon, he's got tons of other weapons to use!. I love these two figures so much. They are, for all intents and purposes, Master Piece Ironhide and Ratchet to me. I'm excited to see how they match up to MP Sideswipe.